SecuraSoft™ Lotus Notes to Office 365 tool is all in one that proves to be a very efficient tool for Lotus Notes Database Conversion. This Software completely exports data from Lotus Notes or Domino Server to Office 365 effectively. Software converts multiple mailboxes of Lotus Notes to Office 365 at once. There are no file size limitations during the NSF File conversion process. To do NSF to Office 365 migration efficiently just need the installation of Lotus Notes and credentials of Office 365. 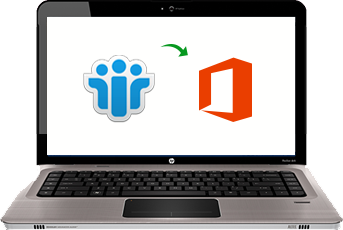 With this Lotus Notes to Office 365 migration tool user can convert Mailboxes directly from Domino Server to Office 365. Through this tool user can map their Domino Mailbox with the Office 365 mailbox. It requires the Live Environment & Credentials of Domino Server and Office 365. Tool to convert Lotus Notes to Office 365 is embedded with so many advance features like if you have maintained more than one account in a single office 365 domain that with the business licenses you can convert any NSF file into any account of Office 365. Lotus Notes to Office 365 migration tools is capable enough to decrypt encrypted NSF mails very smoothly. Software remove encryptions from any email just check/uncheck this feature and you are able to open them in Office 365 Accounts. Lotus Notes to Office 365 converter is feature rich program that efficiently excludes unwanted data using Filter property. Filters can be applied on the Emails, Calendar & To-do List. Just fill the time intervals from which you want to import data within Date Range Features. While Convert from Lotus Notes to Office 365 certainly you have various folders that you don't want to migrate in Office 365 accounts. User can eliminate those folders via 3 different options Exclude Folder, Exclude Deleted Items & Exclude Sent Item option. Once conversion is done you will see all your Meta Data along with Lotus Notes Doc Links will remain same. NSF to Office 365 converter will carries entire Meta data like internet header, inline images, Hyperlinks; Doc links etc. into Office 365 accounts. Amazingly Designed Software, Really I have never seen any tool like this. I must recommend this Lotus Notes to Office 365 converter for all big entrepreneurs who are looking for Lotus Notes data conversion utility. Trust it blindly! I can say this is a perfect utility to convert mailboxes from Lotus Notes or Domino to Office 365 very efficiently. Before purchase I have tried its Demo tool and got outstanding result it does not allow any harm to the single character. Really keep it up Guys!. From one of my good friend I was suggested to opt this NSF to Office 365 converter to convert Domino mailbox to Office 365. Earlier I was in doubt that it will work or not but its Demo Version eradicates all my doubt in one second. I would like to say one thing that working of this software is beyond my expectations. It migrate all my data without any changes also maintain hierarchy and other properties. Lotus Notes is one of the prominent desktop mail client deployed by IBM. It is a more secure client compared to the other clients. Most of the enterprises use Lotus Notes for emailing, storing contact details, maintains to-do lists, etc. It is enriched with many other features and supports Domino Server. It creates two files to store database one is "usernames.nsf" and other is "names.nsf" for the contacts. Just to come with advancement in the Technology, Mostly entrepreneurs move towards the Cloud Services. You can get any services from cloud without bothering that how you handle them. Office 365 will handle all your data with onedrive and you have to just start your subscription pack according to your desires (Annually or Monthly) to get the services. After opting Office 365 user may reduce the consumption space in local drive to store the data files. Lotus Notes to Office 365 Converter is full of advance properties like Filters, Encryption Remover, Meta Support, Bulk Conversion and no issues with the version of any application. NSF to Office 365 Converter is basically meant to convert data from Lotus Notes or Domino Server to Office 365 without any hurdle. This software is implemented with all the topmost properties and serves in an easiest interface.